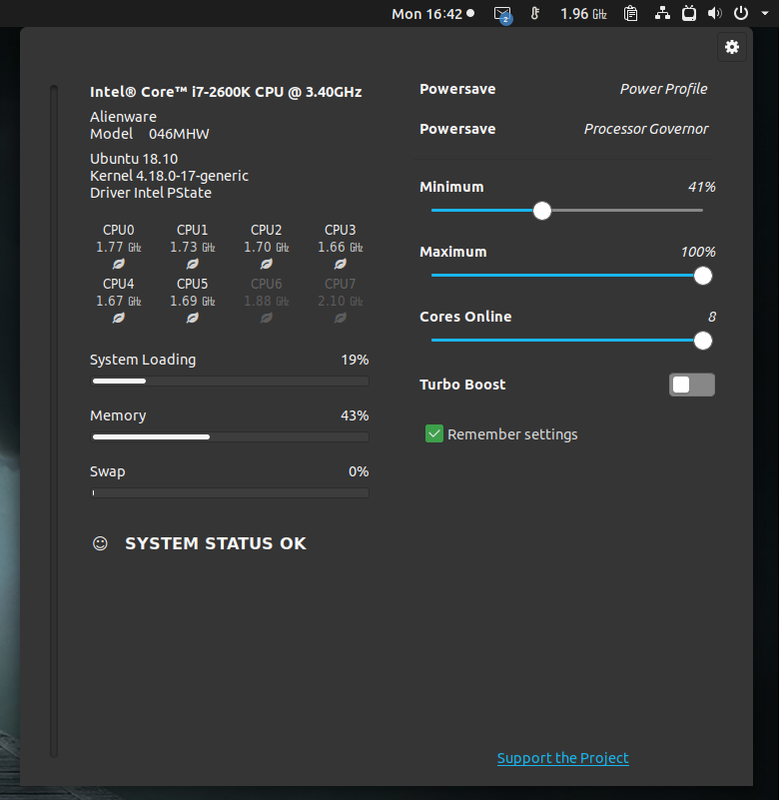 CPUFREQ Power Manager GNOME extension was recently ported to Gtk. In the future, this will allow the extension to work on other desktop environments, but for now it still requires Gnome Shell. CPUFREQ Power Manager (or just CPUFREQ) is a CPU frequency monitor and governor manager. It shows the current CPU frequency, while also allowing the user to change the CPU governor (performance/powersave), a feature which works with both Intel P-State and the CPUFreq kernel module. 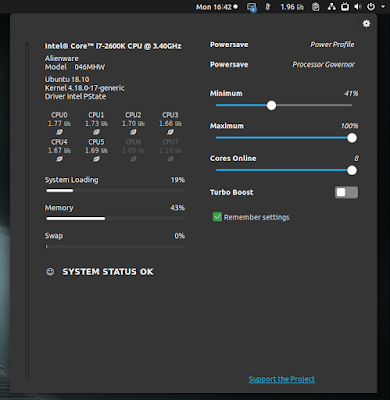 Besides CPU frequency monitoring and governor management, the application can also set CPU frequency speed limits, enable or disable Turbo Boost, set the numbers of online cores, while also allowing users to create their own custom profiles. With the latest release (version 33.0), CPUFREQ Power Manager, which was originally a GNOME Shell extension, was ported to Gtk. It still requires the GNOME desktop for now, and it can be installed from the GNOME Shell Extensions website, but this should change with future versions, as the goal is to make the application work on non-GNOME desktops. The new Gtk user interface offers enhanced functionality and UI compared to the GNOME Shell extension limitations. Also, with the port to Gtk, CPUFREQ Power Manager should free up some system resources by moving many of its functionality from persistent Gnome Shell memory to a standalone application, while also extending its Gnome Shell support to 3.14 - 3.32. I did notice a drawback to this on my system though: clicking on CPUFREQ Power Manager on the GNOME Shell top bar to bring up its user interface now takes 1-2 seconds while it was previously instant. I'm hoping this will be improved in future releases. You can install the extension using the Software application on some systems, by searching for and installing cpufreq (with extensions.gnome.org shown as a source). You can also install CPUFREQ by visiting its extensions.gnome.org page and switching the slider to ON. To be able to install extensions from extensions.gnome.org you'll need a browser add-on, and install a package on your system, as explained on the GNOME Wiki.